Luxurious 2+1 duplex apartment in city center. 12-year loan! These are beautiful spacious 3 + 1 apartments with the area of 138m2 in the complex. Laminated parquet, living room and kitchen 80x80 porcelain ceramic tile, LED lighting system, modern kitchen and bedrooms and all cabinets are prepared with first class materials and quality workmanship. Surrounded by lush greenery, within walking distance of shopping centres, close to public transport; unique architecture, sophisticated landscaping, This complex is designed to make your dreams come true. Location is one of the biggest advantages of this complex. 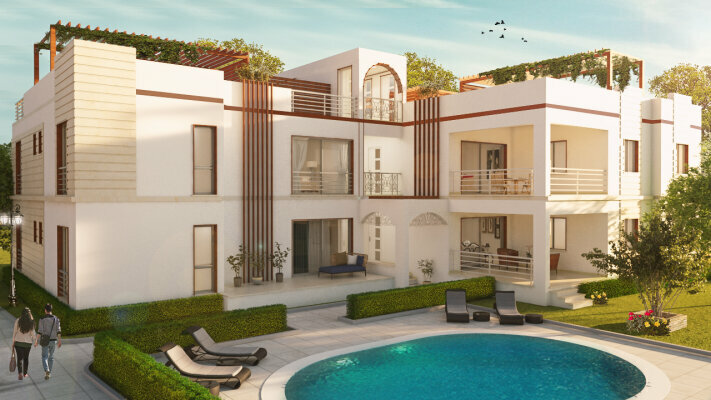 It is situated just 5 minutes away from the center of Kyrenia. There is a big supermarket, popular restaurants and coffee shops, cinema at a walking distance, and an American University in just 5 minutes driving. All this is available with a 40% down payment, followed by easy payments to enable you to enjoy your life with fantastic sea and mountain views.